Many small companies find a business credit card to be an extremely useful and convenient source of finance. It is fairly simple to get approved for one and a large number of firms ranging from startups to small enterprises use them. According to a study by Mercator Advisory Group, a consultant to the payments and banking industries, there were 13.9 million small-business credit card accounts in 2015. This number accounts for just 4% of the general-purpose credit cards in circulation. But the amount spent on these cards is a massive $430 billion, a sum that accounts for one in every six dollars spent on general purpose cards. Why are business credit cards so popular and what are the advantages for small firms in using them? Practically every business credit card comes with handy accounting tools to help you track your expenses. When you are running a small business, it is very important to separate your personal expenses from the amount spent on your company’s activities. Among its other features, a business credit card helps you do exactly that. You will really appreciate the utility of this feature when it is time to file your taxes. Several cards also offer QuickBooks integration, a facility that will help you with your accounting records. Expense tracking, report generation, and the preparation of periodic summaries will become much easier. Your business credit score is different from your personal credit score. Business credit scores are issued by Equifax, Experian, Dun and Bradstreet (D&B), and Fair Isaac Corporation (FICO). 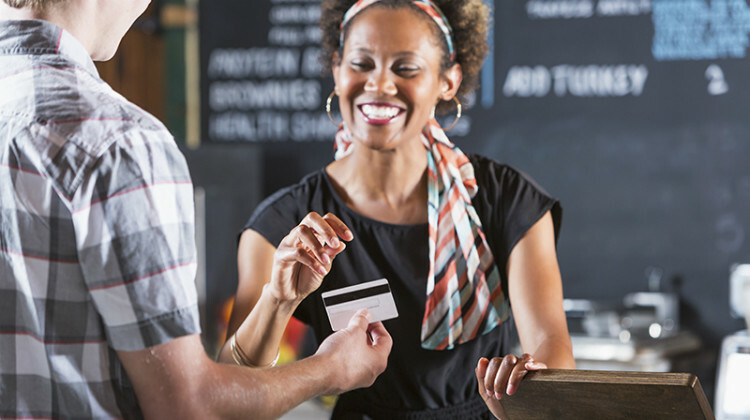 Although there are various types of scores, a good repayment record on your business credit card can help you establish and maintain yours at a healthy level. The other factors that go into a business credit score are your credit utilization rate and whether you have had any past bankruptcies. In addition to paying your dues on time, try and get a higher limit on your card. This will allow you to maintain a lower utilization ratio, resulting in a better score. Remember that your business credit score is not totally within your control. For example, when calculating your score, the industry that you operate in will be considered. Additionally, the number of years that your business has been in operation is also an important factor. But a consistent and disciplined approach can help you achieve a better score. Once you get a high score, you will find it easier to raise funds for your business. For example, if you want a loan guaranteed by the Small Business Administration, you need a minimum FICO Small Business Scoring Service (SBSS) score of 140. There are several other major advantages of having a good business credit score. You will no longer have to rely on your personal credit for getting financing for your company. Strong business credit will also lower your interest costs and other expenses like insurance premiums. Many entrepreneurs spend large amounts on their business credit cards. This gives them the opportunity to benefit from the generous reward programs that Visa, MasterCard, and American Express have instituted for their business credit card customers. If you have a Visa card, you can enroll at Visa SavingsEdge. There is no fee for enrollment and you are allowed to enroll up to 10 Visa Business cards if you are the business owner. When you shop at participating merchants, discounts will be automatically posted to your card statement. The discounts that you earn can add up to a substantial amount. For example, with a Visa business card, you are eligible for a 10% discount on auto parts from Sear PartsDirect. Discounts are available in various categories of goods including dining and entertainment, electronics, and travel. Similarly, MasterCard Easy Savings is an automatic program that allows small business cardholders to get rebates by shopping at participating merchants. Discounts are available in various categories including travel and entertainment, office supplies, telecom, and computer/technology. A great benefit of a MasterCard business card is the access to the MasterCard Easy Savings Hotel Network. This gives you a 4% rebate at over 6,000 participating midscale and economy hotels such as Super 8, Holiday Inn, Ramada, and Howard Johnson. Business cards on the American Express platform get significant discounts under the OPEN Savings program. Instead of earning a discount, cardholders have the option of getting additional membership rewards points. The American Express program has just four partners. Each of FedEx, HP, Hertz, and Hyatt offer a 5% rebate. While merchant participation is limited, the significant discount from four major brands makes the American Express business card an excellent choice. If you have a business credit card, your card issuer will allow you to request employee cards that are linked to the main account. This feature simplifies accounting and leads to the reduction of reimbursement claims from staff members. As a small business owner, you have the opportunity to delegate work while being secure in the knowledge that an up-to-date record of all transactions will be available. In many cases, it is possible for you to set individual limits for each employee card. You could also ask the card issuer to issue an alert each time one of the employee cards is used. Every small business occasionally requires an infusion of capital. Your funds may be blocked in inventories or debtors. There could also be a situation where you need to pay your workers, but just do not have the cash available to do so. A common solution for a small business is to opt for a working capital loan or a line of credit. But this takes some time to arrange. In many instances, lenders may require you to fulfill several conditions before they consider your loan application. Entrepreneurs have found that a business credit card often offers the ideal solution. Card issuers are happy to provide you a credit limit without asking for collateral. You need not pledge any assets as security for the repayment of the amounts that you draw on your card. Many business credit cards offer a 0% introductory rate promotion. The card company will not charge any interest for the first six or 12 months. Of course, you will still need to make minimum monthly payments. If you decide to get a card that offers a 0% introductory rate, it is a good idea to confirm the interest rate that will apply after the initial period. If this is very high, it may not make sense to get that card at all. Some business owners follow a practice of paying off their entire monthly billing amount in full when they receive their card statement. They use their credit card as a financial cushion to see them through times when their customers do not pay or when they need emergency funds. Although these cards offer a host of benefits and great convenience, there are several precautions that you should take when using them. A credit card issued specifically for your small business may require a personal-liability agreement. Under its terms, your personal assets could be used to pay off your debts to the card issuer. Not paying your card dues on time could affect your personal credit score and have an impact on your ability to borrow money. It is advisable to understand the complete implications of what you are getting into before signing a personal-liability agreement. Small business credit cards do not carry the same degree of protection that consumer credit cards do. The Credit Card Accountability Responsibility and Disclosure Act of 2009 also known as the Credit Cardholders Bill of Rights or the CARD Act, offers protection in several areas to consumers. But it does protect business cardholders. This implies that if you use a business credit card you may not have the same level of assured services when disputing billing errors or returning defective goods. Card issuers can also increase the interest rate on your business card if you delay payments or go over-limit. While they can do this with consumer cards too, there are several restrictions that the CARD Act imposes on them. Before selecting a business credit card, inquire about the length of time you have to make your monthly payment. The CARD Act stipulates that consumers should be given at least 21 days after their bills are delivered to them. Consumer credit cardholders get a 45-day notice before rates on future charges are increased. During this time-window, they can cancel the card if they want to. But your business credit card issuer may not give you a lengthy prior notice before increasing rates. A business credit card is definitely a must-have for any small business. It offers great convenience and an easy way to track and control your expenses. Many businesses also use it as a line of credit that they can draw upon when required. Small business owners should shop around and find a business card that fits their needs. With the wide range of options available, it is possible to find one that would not only offers several benefits, but also help to boost your company’s profits.